HoPE goes to victory lane… | Families for HoPE, Inc. In recognition of the beginning of another NASCAR® racing season and in memory of Cayden Arnold, we share this special story of HoPE from 2008. 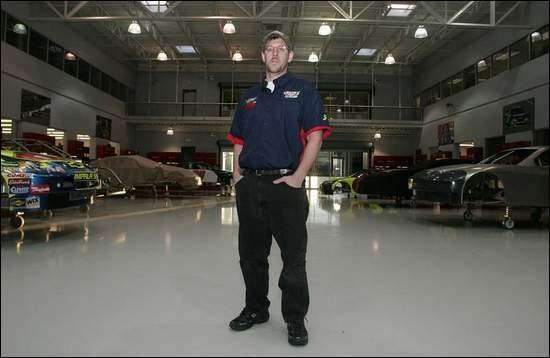 Mechanic Joey Arnold has remained committed to Dale Earnhardt Jr.'s race team despite recently having a son pass away. DAYTONA BEACH, Fla. — A blind child who could see. A deaf child who could hear. A miracle is a miracle, no matter how short it lasts. Dale Earnhardt Jr.’s big victory in his debut with his new team was a speed bump compared to one crew member’s struggle to help his family with life and death — all while continuing his work to put Earnhardt in victory lane. That’s why Earnhardt’s Hendrick Motorsports crew dedicated their win in Saturday’s Budweiser Shootout exhibition race to teammate Joey Arnold, whose 4-year-old son, Cayden, had died eight days earlier. Crew chief Tony Eury Jr. choked up with emotion during the postrace news conference, saying how stunned he was to return to the team’s shop in Charlotte from a recent test session and find Arnold already back at work and talking about, of all things, winning the Daytona 500. Arnold was stunned by the gesture from Eury, who came to the Hendrick team with Earnhardt in the offseason and doesn’t know Arnold well. “It shows that he’s a class act, and that he has the perspective that there’s bigger things in life than race cars,” Arnold said in a telephone interview from the team’s shop. But Arnold and his wife still are struggling to come to terms with the loss of their son, who had been battling a birth defect that severely hindered his brain development and confined him to a wheelchair. By speaking out, Arnold hopes to raise awareness of his son’s condition. In many ways, it was a miracle that Cayden even was born. Doctors diagnosed Cayden with holoprosencephaly, a disorder that prevents complete development of the brain, in the womb and told Arnold and his wife, Shira, that he would likely die before being born. Cayden proved them wrong — and then some. Still, the Arnolds were told to lower their expectations. Cayden was born blind and deaf, and wasn’t likely to develop mentally. With an implant, he could hear. His vision developed. He could recognize colors and objects. And he certainly knew who his parents were. In recent weeks, Cayden started taking bigger steps — literally. He was beginning treadmill therapy to learn how to walk. He was beginning to learn how to use a computer to speak. Then one day he was able to eat solid food, not pureed food, at three meals for the first time ever. That night, he surprised his parents by figuring out how to drive his motorized wheelchair to the end of the driveway and back without help. Then he went to bed and never woke up. How did the Arnolds explain that to Cayden’s 2-year-old sister, Skylar? Cayden died Feb. 1, a Friday. Arnold went back to the Hendrick shop that Sunday, and told a co-worker that he’d be back into work on Monday. Arnold used to travel with the team to races, but took a job that didn’t require him to travel after Cayden was born. He’s now Earnhardt’s car setup specialist, meticulously checking and adjusting parts and pieces before each race car leaves the shop. He finds comfort in the family atmosphere at Hendrick, and a purpose: Winning Sunday’s Daytona 500. Hendrick lost his son, Ricky, his brother, John, two nieces and several key team members when a team plane crashed in 2004. Hendrick called Arnold when he heard about Cayden, and was shocked to hear that he was at the race shop when he answered his cell phone. “I think he needed to put his energy somewhere, but I don’t know that I could have done that,” Hendrick said. Arnold isn’t finding it hard to concentrate on his job — not any harder than any other day of his life, anyway. The Arnolds laid Cayden to rest last Wednesday. At the funeral, he spoke of salvation. His wife talked about Cayden’s ability to beat the odds. Used with permission of The Associated Press © 2008 All Rights Reserved.